On Saturday 17th February, the streets around Soho and Chinatown will be transformed with even more vibrancy, colour and Far Eastern charm than usual, as the place erupts in celebration for Chinese New Year. Dragon dancers, boisterous parades, glowing red lanterns and awe-inspiring street performers will turn the area into a dazzling display of Chinese culture that welcomes the Year of the Dog. At Randall & Aubin we’ll be celebrating the Chinese New Year in the best way we know how – with a sumptuous and luxurious menu befitting such an occasion! 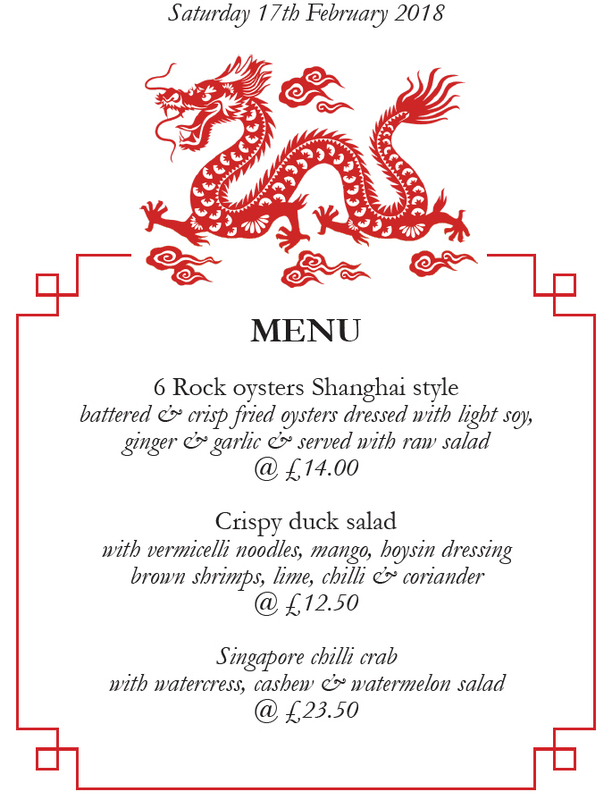 Oysters of course feature on the menu, given a delectable oriental twist as we present them Shanghai-style. Rock Oysters are lightly battered to create a crispy casing, then served with soy sauce, ginger and garlic, alongside a raw salad. Bright, fresh, and embracing all the wonderful flavours of the Far East, this is a platter of perfection not to miss. For a starter, make sure to try the Crispy Duck Salad – a striking combination of vermicelli noodles, juicy mango, rich hoisin dressing and brown shrimp, all muddled with lime, chilli and coriander for that lip-smacking finish. And the main event is a true specialty that’s a feast for the eyes as well as the stomach – our Singapore chilli crab with watercress, cashew and watermelon salad, perfected by Chef Ed Baines, is a real show-stopper. Chinese New Year - also known as the Spring Festival and the Lunar New Year - is an important Chinese festival celebrated at the turn of the traditional lunisolar Chinese calendar. This year marks the beginning of the Year of the Dog. If you were born in 1934, 1946, 1958, 1970, 1982, 1994 or 2006 you belong to the year of the dog, and traits you are believed to possess include loyalty and honesty, and kindness – although you can sometimes be stubborn and struggle with communication! Well, no matter what sign of the zodiac you were born under, there’s no mistaking that when it comes to a Chinese New Years feast, there’s only one place to come – Randall & Aubin brings the delectable tastes of the Far East to London, with a hearty dose of celebration too. These special dishes will be available alongside our usual a la carte menu on Saturday 17th February only.